When Winter is finally over, and Spring is being enjoyed, all of a sudden I get a craving for Summer. Weird, isn’t it? My musings based on nostalgia (looking back) somehow have the power to stimulate future-oriented cravings in me. In this case, the yearning is for a pasta recipe that is eaten at room temperature during the season when tomatoes taste the best: i.e. Summer. All of us at Giardini di Sole (Sandy, Libby, Liz and I) love to cook , and we are not beyond the commission of excess in the kitchen department. Husbands, family and friends don’t seem to mind so I can’t see us reining in any time soon. This is Liz Macrì’s recipe. 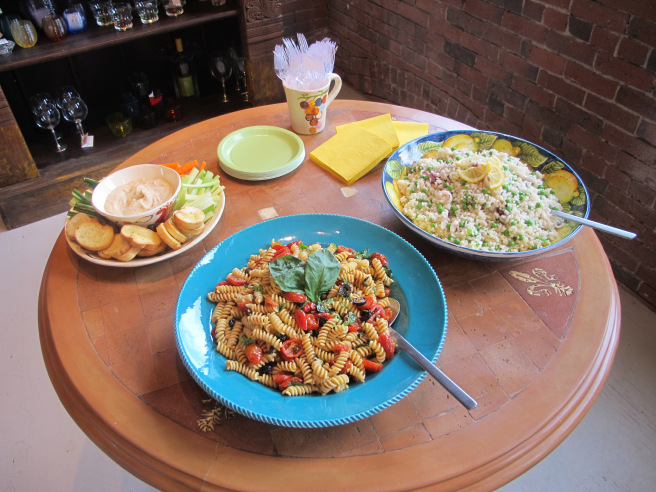 It was one of the dishes we prepared for our Open House day in our showroom in SoWa Boston in May 2013. You will also need parchment paper to line the baking trays. A tip: It is not always that one has access to fabulous tasting tomatoes, so it’s not a bad idea to sprinkle a little sugar over them. 1. Don’t forget to sprinkle salt. It’s best to sprinkle some salt over the tomatoes before you begin doing anything else. 2. 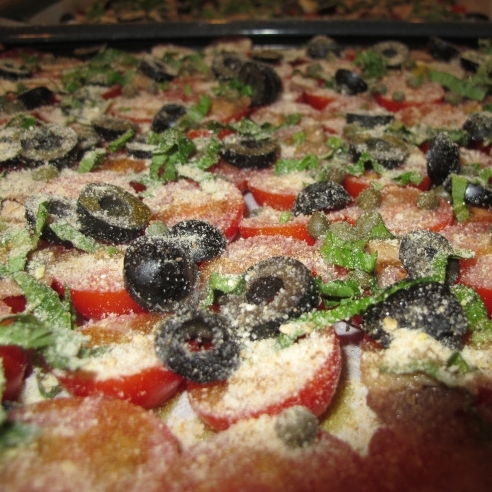 Liberally strew capers, sliced garlic, sliced olives, anchovies and ribbons of basil over the tomatoes. 3. 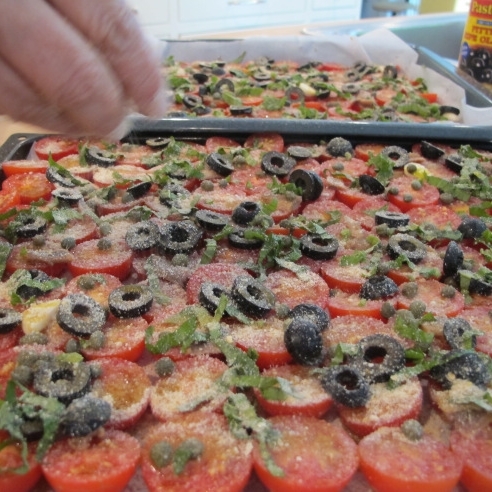 Douse the tomatoes with olive oil and sprinkle a dusting of breadcrumbs. 4. Pop the trays into a preheated oven, on a fairly low heat, 120°C (248°C), and cook until they are ready. This can take any time between 40 minutes and 1 hour. It all depends on the oven and the amount of tomatoes being cooked. After draining the pasta, spread it out evenly over a clean towel, so that it will cool down quicker. Once cooled, drizzle some olive oil (not too much) and mix well. This is to prevent the pasta from sticking together. Toss pasta with the cooled baked tomatoes, a little bit of extra virgin olive oil as needed and serve. A light sprinkle of fresh basil leaves is the finishing touch. Note: If you want to eat the pasta dish later in the day, or even the next day, you can store the tomatoes and pasta separately in the fridge, sealed with clingfilm. It’s best not to eat the pasta cold, so remove all the ingredients from the fridge at least one hour before eating and toss together just before serving.